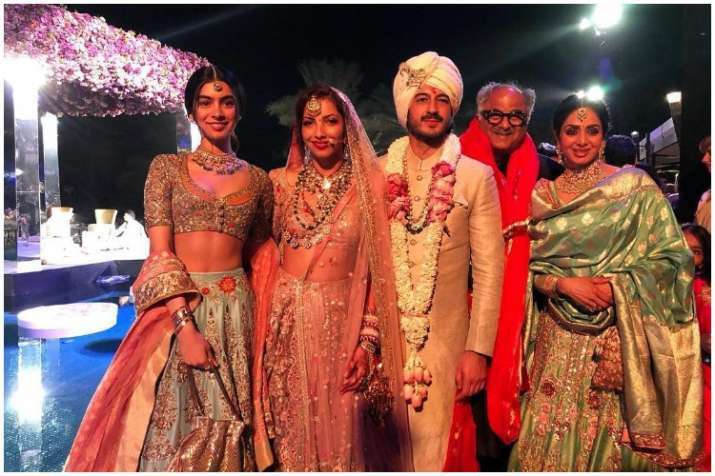 Veteran actress Sridevi is beaming with happiness in the video from Mohit Marwah's wedding. Veteran actress Sridevi was in Dubai for the wedding of her nephew Mohit Marwah. The lady was surrounded by her friends and family in the last few days of her life. A video of the actress from the wedding is going viral on social media in which the lady can be seen beaming with happiness. With her younger daughter Khushi Kapoor. Her elder daughter Janhvi Kapoor gave the party a miss because of her Bollywood debut Dhadak. Have a look at the videos and pics from the wedding. Sridevi looked drop dead gorgeous in all the pics and it’s hard for people to believe that the lady is no more with us. It was indeed a black day for Bollywood and celebrities have expressed grief over the death of the lady. From Amitabh Bachchan to Rajinikanth, B-town celebrities have mourned the death of the actress. It goes without saying the film industry has lost one of its finest gems. Her dead body is being brought from Dubai to India. Latest reports suggested that it will reach around 8:00 pm today. On a related note, the veteran actress was last seen in Mom.